This game marked the fourth time the Royals had rallied back from a multi-run deficit to win in this post-season. With the Royals trailing 3–0, Ben Zobrist led off the seventh inning with a pop-up to shallow right field. Second baseman Ryan Goins had a lead on the ball and waived off charging right fielder José Bautista only to duck out of the way at the last moment, allowing the ball to drop for what was ruled a single. The Royals went on to score five runs in the inning. This marked David Price's seventh consecutive playoff loss, tying him with Randy Johnson for the record. In the top of the twelfth inning, with Addison Reed pitching for the Mets, Pérez hit a single for the Royals. Pinch running for Pérez, Jarrod Dyson stole a base and scored on a single by pinch hitter Christian Colón. Colón scored on a hit by Paulo Orlando, who had substituted into the game earlier. The Royals loaded the bases, and Cain drove home three more runs with a double off Bartolo Colón. Davis pitched a shutout inning for the Royals to complete the series and win the championship; he struck out Wilmer Flores looking to end the game, series, and baseball season. ↑ "2015 Kansas City Royals Sortable Schedule". Kansas City Royals. ↑ Chisholm, Gregor; Flanagan, Jeffrey (October 17, 2015). "KC pops Price's bubble in 7th for 2-0 lead". mlb.com. Kansas City, Missouri. Retrieved October 20, 2015. ↑ Corcoran, Cliff (October 17, 2015). "Royals come from behind to defeat Blue Jays in Game 2 of ALCS". Sports Illustrated. Kansas City, Missouri. Retrieved October 18, 2015. ↑ SI Wire. "World Series Game 1: George Brett to throw out first pitch – MLB". SI.com. Retrieved October 31, 2015. ↑ Normandin, Marc. "It's Matt Harvey vs. Edinson Vólquez in World Series Game 1". SBNation.com. Vox Media. Retrieved October 28, 2015. ↑ Snyder, Matt (October 27, 2015). "Edinson Vólquez's father dies on day of World Series Game 1". cbssports.com. Kansas City, Missouri: CBS Interactive. Retrieved October 28, 2015. ↑ Gonzalez, Alden (October 28, 2015). "Volquez learns of father's death after start". MLB.com. Kansas City, Missouri. Retrieved October 28, 2015. ↑ Gonzalez, Alden (October 28, 2015). "Escobar's inside-the-park HR one for the ages". mlb.com. Kansas City, Missouri. Retrieved October 28, 2015. ↑ Berg, Ted (October 27, 2015). "Alcides Escobar hits leadoff inside-the-park home run in World Series Game 1". USA Today. Kansas City, Missouri. Retrieved October 28, 2015. ↑ Bloom, Barry (October 28, 2015). "No HR, but Murphy has 10-game hit streak". MLB. Kansas City, Missouri. Retrieved October 28, 2015. ↑ Hoch, Bryan (October 28, 2015). "Granderson goes deep, robs hit in Series return". mlb.com. Kansas City, Missouri. Retrieved October 28, 2015. ↑ "World Series 2015: Mets 4–5 Royals — as it happened". The Guardian. October 28, 2015. Retrieved October 28, 2015. ↑ Hagen, Paul (October 28, 2015). "Gordon's heroics rewrite Game 1 ending". mlb.com. Kansas City, Missouri. Retrieved October 28, 2015. ↑ Crasnick, Jerry (October 28, 2015). "Eric Hosmer's sac fly in 14th gives Royals dramatic Game 1 win". ESPN.com. Kansas City, Missouri. Retrieved October 28, 2015. ↑ Verducci, Tom. "Life and death provided backdrop for wild, historic World Series opener". Sports Illustrated. Retrieved 1 November 2015. ↑ "Royals go up 2-0 on Mets in World Series behind Johnny Cueto's 2-hitter". ESPN News Services. Kansas City, Missouri. Associated Press. October 29, 2015. Retrieved October 29, 2015. ↑ "Johnny Cueto outpitches Jacob deGrom as Royals take 2-0 World Series lead". The Guardian. October 29, 2015. Retrieved October 29, 2015. ↑ Lacques, Gabe (October 29, 2015). "Royals' Johnny Cueto makes history with World Series complete game". USA Today. Kansas City, Missouri. Retrieved October 29, 2015. ↑ Justice, Richard. "Ventura vs. Thor a showdown of MLB's hardest throwers". MLB.com. Retrieved 31 October 2015. ↑ Kerber, Fred. "Mike Piazza kicks off Game 3 with 'doo-doo' 1st pitch". New York Post. Retrieved 31 October 2015. ↑ Simon, Andrew. "Conforto in LF for Mets; Morales out for KC". MLB.com. Retrieved 31 October 2015. 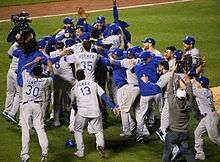 ↑ "Royals' Raul A. Mondesi, 20, makes World Series history with debut". ESPN. Retrieved 31 October 2015. ↑ "World Series 2015: Demi Lovato to sing Game 4 national anthem, Tim McGraw gets 1st pitch". NJ.com. ↑ "Blogs - Sports Blogs - ESPN". ESPN.com. Retrieved October 31, 2015. ↑ "Royals Alex Rios loses track of outs in Game 4". Major League Baseball. ↑ "Mets Michael Conforto homers twice in Game 4". Major League Baseball. ↑ "Alcides Escobar, Ben Zobrist notch records". Major League Baseball. ↑ Waldstein, David (November 1, 2015). "For Royals' Edinson Volquez, a Bittersweet Start in His Father's Memory". The New York Times. Retrieved November 1, 2015. ↑ Boone, Tony (May 5, 2016). "Big year hard to ignore, but Chasers' Jose Martinez must follow up to get closer to big leagues". Omaha World-Herald. Retrieved May 27, 2016. ↑ FOX Sports Midwest (May 25, 2016). "Cardinals acquire OF Jose Martinez from Royals, assign to Memphis". Fox Sports Midwest. Retrieved May 27, 2016.